Summary BYOD two-bay Marvell 1.2 GHz Kirkwood RAID SATA NAS with many serving options. I've been working my way through a big box of NASes that QNAP sent me. This time, it's the TS-212, two-bay sibling of the single-bay TS-112 and four-bay TS-412 (yep, I'll be reviewing that one, too). Styling is so similar to the 112 that you might mistake one for the other, except for the 212's wider girth and additional HDD status light on its front panel. 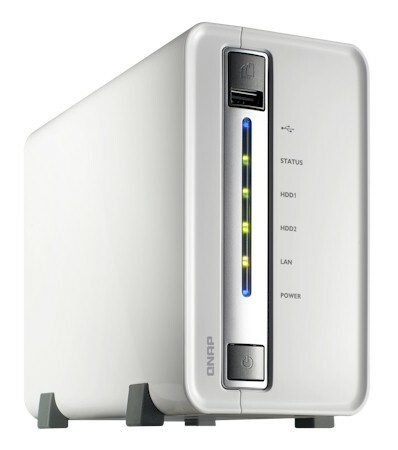 The rear panel holds a disappointing discovery, however—no eSATA port, as shown in the photo below. You do get three USB 2.0 ports and a single 10/100/1000 Ethernet port supporting up to 9K jumbo frames. The photo below shows the two 3.5" Samsung Spinpoint F1 1 TB (HE103UJ) drives QNAP installed for the review. The 212's mounting plate accepts only 3.5" SATA drives. I didn't disassemble the 212 further, since it was obvious that an alternate loading of the TS-112's board is used for the 212. A simple add of an internal SATA socket at the front and a delete of the external eSATA port at the rear, different drive mounting bracket and cable for the second drive and Bob's your uncle. To save you a click over to the TS-112 review, the parts rundown is: 1.2 GHz Marvell Kirkwood (88F628210C120) heatsinked SoC, 256 MB DDRII RAM, 16 MB of flash, Microchip PIC16F690 Flash-Based 8-Bit CMOS MCU and Genesys GL850G 4 port USB 2.0 Hub. I've even thrown in a shot of the TS-112's board below. Power consumption measured 21 W with the drives spun up and 8 W with them down. Like the TS-112, the 212 was whisper quiet, with the fan staying quiet even during testing. I upgraded to 3.4.3 Build 0520T firmware before testing. This version includes the newish MyCloudNAS feature and ElephantDrive cloud backup option. I've covered MyCloudNAS in the TS-112 review. For a run-through of V3's other features, see the review or the online demo.